Interesting research from WRAP reveals that over forty percent of us believe that because food is biodegradable, it is harmless when it gets thrown out and sent to landfill and are not aware that it can produce methane, a powerful global warming gas which damages the environment. Of course the same waste composted at home produces no methane and provides free fertiliser and soil improver for our gardens. In a drive to raise awareness, market traders across the country are to back a campaign to get Britain composting, thanks to a partnership between Recycle Now and the National Market Traders’ Federation that launched this week at Queen’s Market in Newham. From today, traders will be offering green tips to their customers along with their purchases, to encourage them to compost household waste such as fruit and vegetable peelings, instead of throwing it away. 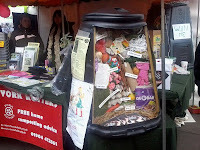 The "Ask me about composting" programme will then roll out across the UK over the next few months. If you haven't been to our local market, I'd recommend it, especially as it was listed in The Guardian's 10 of the best markets in England. It really does come highly recommended. In the meantime anyone wishing to find out more about composting and how to get started should visit www.recyclenow.com/compost or call their infoline on 0845 600 0323. 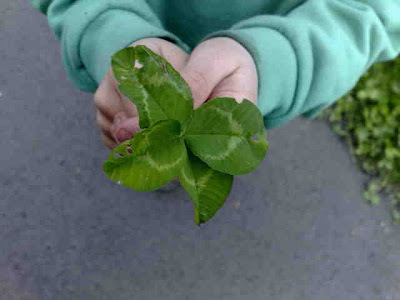 A very large four leafed clover, from a secret location in Suffolk. It might just come in handy for March. I am really proud to share the exciting news that I've been shortlisted for one of Suffolk's prestigious Creating the Greenest County awards. So how excited am I! Well, I know I said I'm proud...but the truth is I am totally chuffed to bits. Affectionately called the Green Oscars, the Creating the Greenest County awards are now in their third consecutive year, celebrating the efforts of individuals, businesses and communities who support Suffolk's aspirations to engage the whole county in responding to climate change. And I've been shortlisted in the Community: Communication and Events category. and helping my local community do this..
..then talking about it in places like this! It's because I want to encourage more people to reduce the amount of this! I hoped that by entering the awards, it would help raise the profile of waste reduction in Suffolk, encouraging individuals and communities to rise to the occasion by boosting our expectations of what our society is capable of achieving. So after such a busy year promoting practical ways of reducing waste, it really is a privilege to have been shortlisted for the Creating the Greenest County awards. However, as far as the results are concerned, I'm afraid I'm going to have to leave you on tenterhooks because they won't be announced until three weeks time, at a Gala dinner on the 18th March when I'll get to mingle with the Suffolk's "greenerati" . In the meantime, I've got plenty to get on with, including our street's Waste Reduction Fortnight that kicks off on Monday. 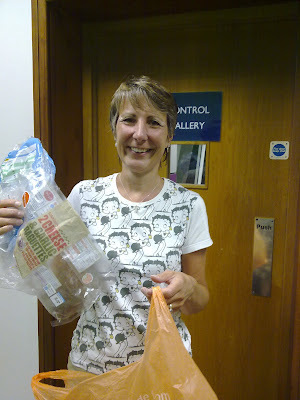 As well as my own challenge, I'll be helping our local school tackle their rubbish too. 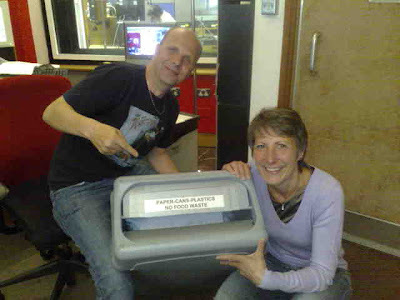 And I'll also be talking even more rubbish later, chatting with BBC Radio Suffolk's forever effervescent James Hazell (pictured below with his studio recycling bin and producer Sal, who is just as sparkly ). If all goes to plan it should be about 9.40am this morning. 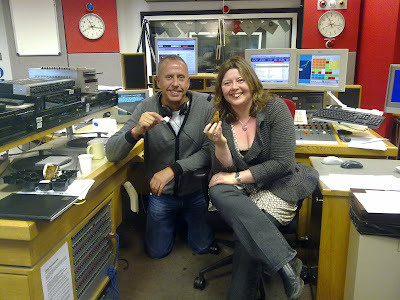 I still haven't quite got used to this radio lark you know. I may not be as nervous as I once was, but I still have to take my shoes off for fear of the audience hearing me pacing up and down my living room. And I promise, once the interview is over I will finally get around to this week's laundry.....otherwise it won't be just my husband who's demanding clean pants....the kids will be in tow too. At least I'm reducing their carbon footprint, well that's my excuse anyway. It's far easier doing the laundry in one go in the style of just-in-time delivery. For more information about all the shortlisted entrants, please visit www.greensuffolk.org. Whoopadey woo, I've finally made it out from my piles upon piles and onto the blog to give you the big declutter update. 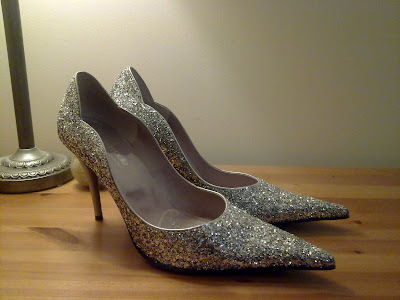 And look at the treasure I've found, a pair of sparkly shoes, which were stashed away in a box on top of the wardrobe. They were placed there for safe keeping, but I forgot where I put them and have spent the last two years scratching my head wondering if I'm going mad. We only live in a three bedroom house, so there's hardly any room for stuff to go amiss, yet in the last couple of weeks, I've also uncovered one of my favourite umberellas, three more pairs of shoes, an MP3 player and a radio alarm. It really is like Christmas all over again. Now that I've found my rewards from my decluttering manoeuvres, it's over to you to see what you can find in your own little treasure trove of stuff that's tucked away or piled up high behind every cupboard and door in your home. Yes, welcome to Week 7 of the Rubbish Diet challenge, where after six weeks of tackling your everyday rubbish, it's time to uncover the things that are wasting away in your clutter hotspots. My goodness, can it really be Week 7 already. That can only mean one thing... that there's just one week to go until I ask you to attempt a Zero Waste Week. Cor blimey! Well, I wouldn't worry about that now, you'll be far too busy working out what to do with the bits and bobs you discover in your big sort out. And as for me, I'm going to slip on my sparkly shoes and treat myself to a nice glass of wine then read the book that I rescued from a pile of stuff that had been crammed into a cupboard in the bedroom. You'll never guess what it's called.....here's a clue! You might snigger but it's never too late. 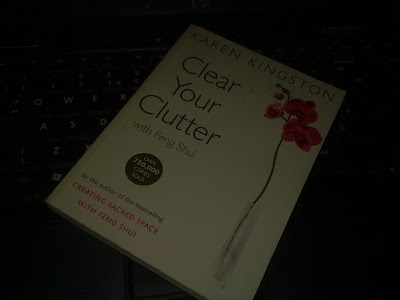 I might have made great progress already but Clare Baker from ClutterClearing writes on her website that as I've kept hold of my clutter for a year, it could take me 3 months to completely clear and organise it. It's worth popping over to see how long yours will take too...assuming you've got some of course. Oh well, it looks like I'll be busy for another month yet. See you next week then, when I'll be sure to pop up for air! 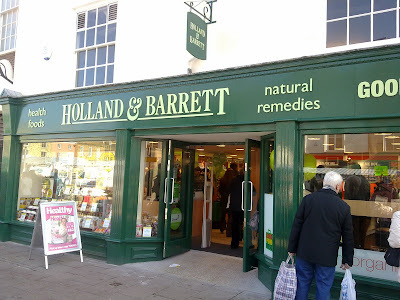 Wandering through the town centre today in Bury St Edmunds, I noticed that the health food and natural remedies store Holland & Barrett had finally moved from their side-street location into a prime hotspot in the Buttermarket, slap bang next to Marks & Spencer. 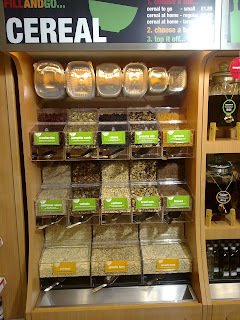 Despite being in a rush, I couldn't resist popping in to see what they had on offer and I'm glad I did, because as I browsed the shelves, I was delighted to see their brand new refill concept called "Fill and Go", which is a self-service facility for dried cereals as well as a fabulous range of olive oils and vinegars. Empty bottles are available for customers to fill with their choice of olive oil and vinegar and customers are encouraged to return their empty bottles in exchange for a discount on their next purchase, which is brilliant news. Plastic containers are also provided for loose cereal products and fruits. And even though these are the more flimsy "disposable" type, there's no reason why they can't be returned for a top-up when empty. The "Fill and Go" service is currently a pilot project that is unique to Bury St Edmunds' brand-new store and if successful it will be rolled out elsewhere. 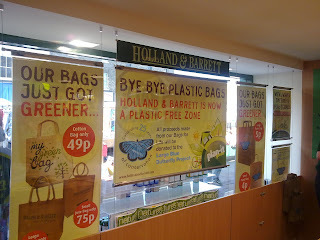 However, Holland & Barrett has also introduced wider changes that will please the waste-free consumer, including the decision to become a plastic bag-free zone across all stores in the UK. Having said goodbye to plastic bags, customers are now encouraged to use their own reusable bags each time they shop or to buy one of the store's bags-for-life, the profits of which go to The Large Blue butterfly project, a conservation programme to help reintroduce the Large Blue butterfly species back into the UK. Isn't it amazing what you find out from just popping into a shop for a bit of a rece and the above examples are just some of the more obvious changes that are taking place in-store. Talking to the area manager today, subtle differences have been introduced too, with decisions to incorporate recycled plastic into Holland & Barrett's products as well as shrinking the size of labels and ensuring that all their consumer packaging is recyclable by 2012. The organisation's Plan-it-Green policy illustrates even more examples of sustainable operations elsewhere in the business from head office through to store management. 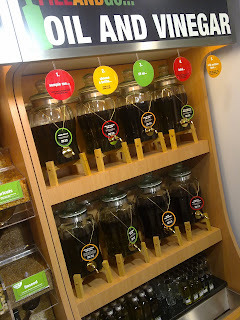 It really is encouraging to witness such changes on the high street and it is no surprise that with Holland & Barrett's history of ethical purchasing that they are one of the forerunners in the revolution to reduce waste. I now hope that lots more high-street retailers - including national chains and independents - will continue to raise their game too. It would be great to think that what I saw today is a realistic glimpse of the future. Knock Knock: Who's there? It's a rubbish blogger in Brandon! So today was the day I volunteered to help promote the Seven Suffolk Streets waste reduction project in Crown Street, Brandon, which is the area that's taking part in the Forest Heath district of Suffolk. And it was a cold, wet and snowy day, certainly not the weather for walking the streets. 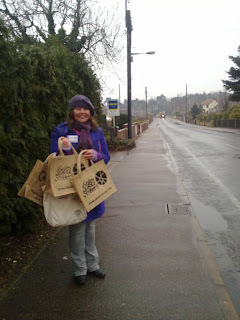 But it was a case of simply wrapping up warm and getting on with the job in hand, which was to knock on strangers' doors to raise awareness of the waste reduction project that's taking place in two weeks time. Despite having my official's badge, I must say it was rather a daunting task. I might have got used to presenting at conferences and doing radio interviews about ways to reduce waste, but knocking on doors is different. It's a little more intimate and it's difficult to know how people will react, so I can only admire the other door-knockers who have been pounding the streets over the last two weeks on behalf of the Suffolk Waste Partnership. But as with most fears, I needn't have worried, because most people who answered my rata-tat-tats or ring-a-ding-dings of the doorbells were interested in the issues and keen to take part. And in certain cases the team - which was made up of me and David whom I introduced last week - got a very warm welcome indeed, with residents being happy to talk about waste issues that affected them. It was also a great opportunity to introduce new services that had been rolled out at the local household waste recycling centres. So after a day out on the streets, I am now glad to be tucked up in the warmth of my home and would like to wish Crown Street lots of luck in the challenge ahead. I also hope that it's a lot sunnier when David and the other regular door-knockers return to visit the rest of the street soon. I'll certainly be thinking of them... from the comfort of my blog! 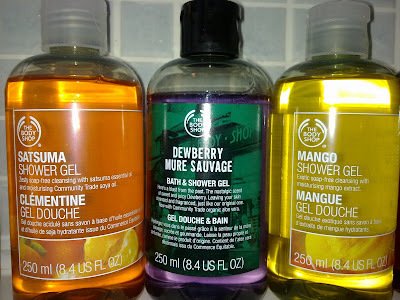 One of these bottle is made from 100% recycled plastic. Can you spot which one? Welcome back to the Rubbish Diet Challenge. It's week 6 already and if you've been busy sorting out how you can reduce waste in the garden, you'll be grateful for an opportunity to relax and pamper yourself indoors. And there will be the chance to pamper yourself this week, plus time to browse the shelves for some beautiful cosmetics that are kinder to your bin as well as your complexion. However, there are some hard decisions to make too, thinking about the kinds of things that would normally make you blush. This week's guide discusses all sorts of things from make-up, to toilet paper and even sanitary products. And for any guys who are looking in, don't worry, it's not all girlie business: if you have teeth and need to shave, there are some ideas that might appeal to you too. Indeed, there should be something for everyone, including tots, kids, the middle-youth and elderly. And as ever, if you can't recycle it, this guide encourages you to find a reuse for it. You'll be surprised what you can reuse these days. Even toothpaste tubes can be reused, as Mrs Green over at MyZeroWaste discovered recently. She's even launching a collection point at her local Sainsburys and Tesco this week and will send them to a charity called the Philippines Community Fund. See her blog for details. And did you know, surgeries across the UK have the opportunity to collect unused and unopened medicines for medical aid in Africa? It's all above board and will keep valuable drugs from being buried or burned. A scattering of snow doesn't quite cover the mud patch. Have I ever told you about my guilty pleasure? If I haven't perhaps now is the time to divulge and see if I can get you on board too. It involves Tom, Barbara, Margot and Jerry and I have to say I love them all. Now before you start thinking it involves anything dodgy like swapping car keys at parties, let me reassure you that it's all clean good fun. Well apart from the odd bit of dirt that is. I'm referring of course to the comedy series The Good Life, which I started watching thirty five years when I was just six or seven years old. I absolutely adored that series. I loved Margot in her long posh maxi dresses and how she was regularly shocked over Tom and Barbara's latest escapades in growing their own and raising animals in their suburban back garden. I always felt really cosy whenever I watched it. Fast forward to a 21st century Sunday morning when sat on the sofa in my pyjamas with the laptop to hand, I discovered the series had been uploaded onto YouTube. Well there are some things that are just too hard to resist when everyone else is tucked up in bed, so I immersed myself in the original episodes over a cup of tea. I was quickly joined by my youngest son who's an early bird too, both up us tucked under a blanket, watching the episode of Tom and Barbara raising chickens for the very first time. For a moment I was distracted by a movement outside and I could see our own hens beating the boundaries for their early morning forage. I then looked over towards our lawn, which now resembles a mud patch and it crossed my mind whether our neighbours could consider us to be the new Tom and Barbara of modern day suburbia. We don't quite have a big veg patch in our garden, but having given the chickens free rein all winter, since they worked out a way to escape the run, it is now looking very much like a farmyard, especially as all our grass has been pecked at and covered in stones and dirt from their scratching habits. So what has this episode got to do with cluttering, you might ask yourself. Well, given that decluttering is about better organisation and tidying up as well as getting rid of surplus things, this weekend I decided to take the bull by the horns and sort out the garden and our crazy chickens. We brushed the scattered stones back into position, raked the mud patch and tidied away leaves and twigs that covered the ground. I even gathered all the kids' broken plastic toys that were used for outdoor play and took them to the recycling centre. And if by chance you are wondering about the fortune of the chickens, don't worry, although we've decluttered them, we haven't rehomed them or anything like that. They're too adorable and obviously far too useful in the egg laying department. They just needed putting in their place that's all. So we've improved the small matter of security in the chicken run, raising the height of the fence that surrounds it and finding an alternative way of securing the gate. You can just see the new fence at the back of the photo shown below. Hopefully it will now keep the chooks at bay. So, as we work our way through February with a much neater backdrop, my attention now turns to the dilemma of the mud patch lawn. We had initially considered restoring it, but since watching The Good Life, I am now really inspired to ditch the idea of turf and use the space to grow more vegetables instead. On an entirely different subject, if you're listening into BBC Radio Suffolk's James Hazell show later, you'll find me joining in the conversation at around 10:10am about whether we have too many bags for life. I know I have lots, but they all come in handy at different times. What about you? Are you a keen collector of bags for life? If so, listen in later, or catch it on Listen Again. *UPDATE* The radio debate has been postponed until Thursday 18th feb. Same time, same place, but with a difference face. It'll be with the lovely Georgina Wroe, who's stepping in for James. 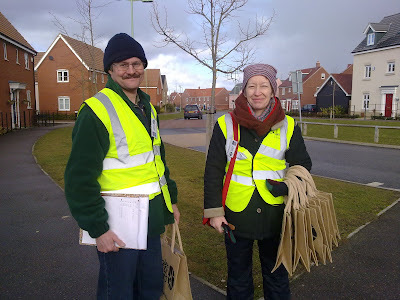 It's always great to see a friendly face when you're out and about and as it happens, just as I was arriving home yesterday, I bumped into David and Halle, a couple of our local master composters, who are promoting the Seven Suffolk Streets project on behalf of the Suffolk Waste Partnership. If you haven't heard of the project before, it's one of the Zero Waste places announced by Defra last year and which has received funding from BREW to help reduce the amount of waste across the county. 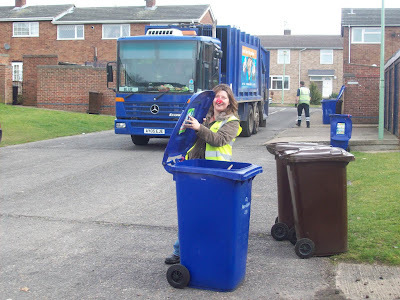 Each of the seven districts in Suffolk has selected one street to be the focus of the waste reduction campaign and as you can guess, my very own street is one of the lucky few, as chosen by St Edmundsbury Borough Council. In November residents received a letter outlining the project as well as a questionnaire about their rubbish and over the last couple of weeks, door-knockers have been visiting homes to introduce the idea in more detail and to offer additional knowledge if needed. It's all leading up to Waste Reduction Fortnight, which will take place in March, encouraging residents, businesses and schools to have a go at reducing their rubbish by 50%. And the best news is, no extra bins are needed, just extra signposting to local facilities that exist nearby. Waste Reduction Fortnight kicks off in our street on 1st March, when our previous rubbish will be weighed for the very first time on bin day. To measure the success of the project, the bins will be weighed for the second and final time two weeks later on 15th March. 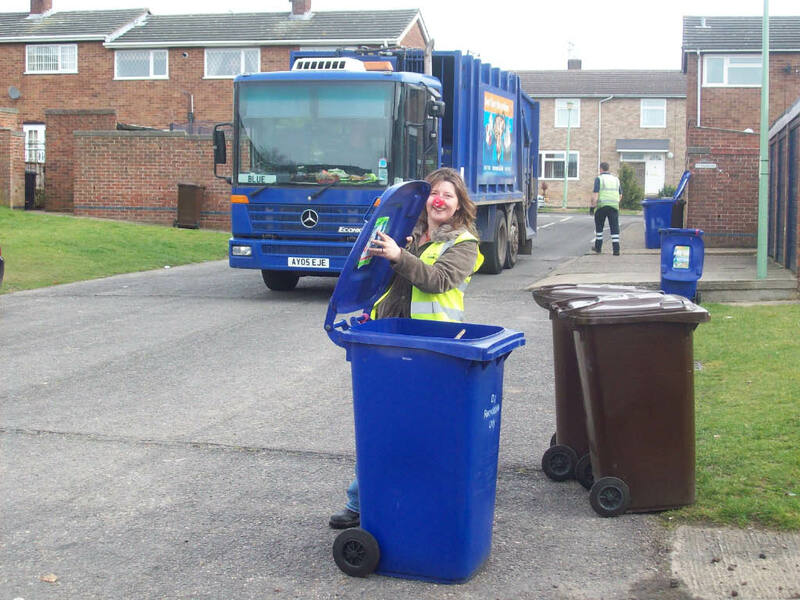 So far, it seems that residents have been very happy to take part, which is brilliant, not just regarding waste reduction, but also because there will be prizes for the streets that perform the best too! So, we could be onto a real winner for our neighbourhood! And I am glad that people have responded positively, because I'm going to be doing a bit of door-knocking too, not on my home patch, but joining the crew in Brandon. So if you live up that way, look out because very soon I could be coming to a street near you. All I can say is, I hope the weather warms up because yesterday I had to rescue David and Halle from a hailstorm that fell thick and fast soon after I took the photo. So keep your fingers crossed, as I don't fair well in the cold. More information about the Seven Suffolk Streets project can be found at the Suffolk Recycling website: www.suffolkrecycling.org.uk. Can you believe we're now at Week 5 of the Rubbish Diet challenge. How time flies. It doesn't seem that long ago, since I was challenging you to your first weigh-in. I hope all is going well with your efforts to slim your bin and that you're enjoying the mini-challenges. This week I hope to inspire you to make further inroads into your household waste by doing some extra things around the garden. That is if you happen to be blessed with a small patch to call your own. 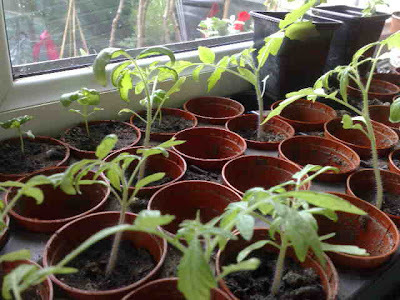 Even if you don't have a garden, you can still join in if you've only got a windowsill going spare around your home. This week's guide will get you thinking about how you can reduce waste whilst gardening and how you can use your garden to reduce waste too, helping you to find ways to avoid packaging and divert your kitchen scraps away from the rubbish bin. There are lots of ideas to encourage you to grow your own and includes a mini-guide to composting as well as an introduction to keeping chickens for those who fancy taking their self-sufficiency a little bit further. So there should be something for everyone this week and even if you're not that much of a keen gardener, I hope you'll get in the spirit and consider planting up at least one small container of your favourite herb, vegetable or fruit-bearing plant. And if you want to be inspired to compost a bit more, don't just take my word for how easy it is. I've gathered a few examples that have been sent in over the last few months from some of my blogging and Twitter friends, both old and new. And here's an example of how the professionals do it too, thanks to expert gardener Claire Brown from PlantPassion, who saw my plea for photos last year via her Twitter account @PlantPassion. 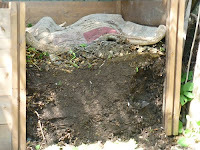 The photo on the left shows the contents from a wooden compost bin, revealing much better quality compost than I make. Claire sent an example of her plastic dalek composter and new tumbler as well. No doubt, this set up will have some readers browsing with envy. Claire also sent me a link to a fabulous blogpost she's written about compost bins and rats and includes useful advice, whether you are a novice composter or have been at it for some time. Visit : http://plant-passion.typepad.com/plant_passion/2009/05/could-my-compost-bin-attract-rats.html. Fellow tweeter and blog reader @MrsBYork sent in a photo of York Rotters' demonstration bin, showing which types of items can go in it. To see a larger version, just click on the photo. 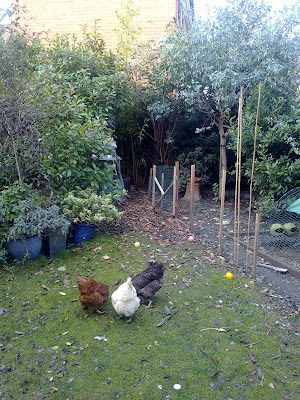 The photo to the right shows Mrs B's compost set up at home, which shows you don't really need much space at all. Sarah Barnard, author, blogger and Twitter user @ethicstrading, has a couple of dalek type bins and revealed how she managed to get one of them free from her local Frecycle Group. As she says, not bad for a freebie eh! Too right, especially as I had to pay around £20 for mine, which is exactly the same as Sarah's. Of course if you've got enough land you don't even need to worry about having a container to put it in. 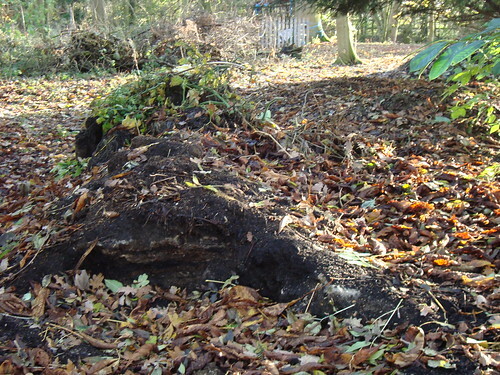 You can simply create your own compost heap in a suitable spot that takes your fancy. So I really don't think I could finish today's introduction to this week's online guide without showing you the king of domestic compost heaps, brought to my attention by fellow Twitter user and composter @MartinCampbell2. Here it is in all its woodland glory. I can only dream of such space and consider it a rather spectacular specimen. Now it's all very well composting, but eventually you also need to do something with it. 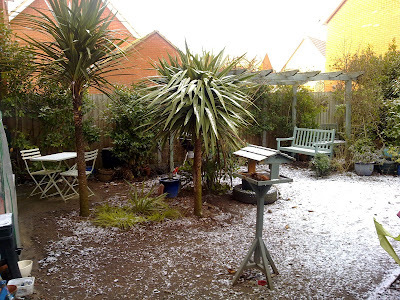 Here's an example of what blogger AllGrownUp does with her compost, proving that you don't even need a huge veg patch to justify going to the trouble. 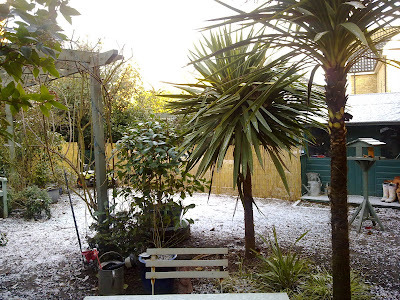 In her blogpost she describes what it's like to "harvest" your compost for the very first time and how it's great to have free stuff made from what would otherwise be rubbish. So with enthusiasm like that, I hope we've all been able to inspire you to get out into whatever space you have and start digging for victory in your war against waste. And when you're finished do go and see how other bloggers are getting on with their own challenges. Share some support and say hi to the following waste watchers: Carol at New Mummy Tips; Pippa at A Mother's Ramblings and Tepary at Grow Family Grow. So far, it looks like they're doing brilliantly. Maybe very soon I'll mention those three little words "Zero Waste Week". Well I might as well start hinting now and it's not as scary as it sounds. Thanks to everyone who's sent photos and links. It really is appreciated. It's always useful to have a whole range of real-life examples that can be shared with others. I have to confess that my decluttering antics have not been going great this last week, partly because I've fallen into the zone of despair wondering where else to tackle first. And it's also been a mixed week with my youngest being off school poorly with an unknown allergy rash. While he insists that he's allergic to potatoes, I've spent my time looking after him and balancing all the other things that need doing such as washing pants and having the odd peek into Twitter. So can you imagine my delight whenI saw a very distracting tweet from @SuffolkHWRC that said [sic]"Hard plastic recycling is now avalible at Hadleigh, Mildenhall & Felixstowe HWRC's". Well that got me excited in a manner that had me immediately pondering a day out at Felixstowe beach...via a sightseeing visit to the recently upgraded Household Waste Recycling Centre. Poor Mr A, I could imagine the response. "Here she goes again," he'd say in a less than enthusiastic manner. But it would be worth it. We've got so many broken plastic toys that have been cluttering up the play shed in the garden that to have the opportunity to send them for recycling would free up a good amount of space. 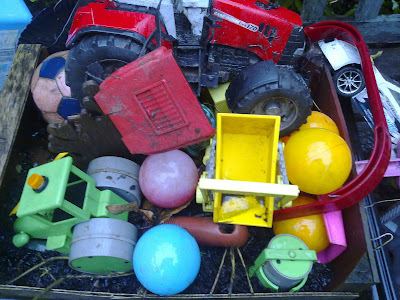 They are old toys which were down-graded to garden play as soon as they had broken bits and were beyond repair. I couldn't bear the idea of them going to waste in landfill so retained them for a while longer instead. But during the last year, the writing has been on the wall. They're hardly played with anymore and it was time to reconsider their future. My first thought was to advertise them on Freecycle, but even with the group's reputation for saving stuff from landfill, I think a bag of dubious, broken, grit-filled toys may be stretching it somewhat. There are enough broken toys in the world to share amongst those who find the need, so I think I will give this bag of stuff a new lease of life and take them along to the HWRC. The good news is however, I discovered yesterday that these facilities are also in place at the HWRC in Bury St Edmunds, so I don't have to circumnavigate the system after all. Mr A will be pleased that he doesn't have to go on a recycling sight-seeing tour next time we're over on the coast. In fact, when I told him last night about the new facilities at Bury St Edmunds, he gave me a huge grin and said "I know"! Apparently, he saw the Hard Plastics sign when he was there last time. Obviously he wasn't as excited as me, as that was weeks ago! But with my new found knowledge I am now on a mission to go through the children's bedrooms as well as the garden and gather together all of those annoying bits of broken plastic toys. I've also got a few old grotty plastic plates that have seen better days too. As far as I'm aware, hard plastics recycling facilities are far and few between in the UK, so it's great that this new opportunity has come to Suffolk. 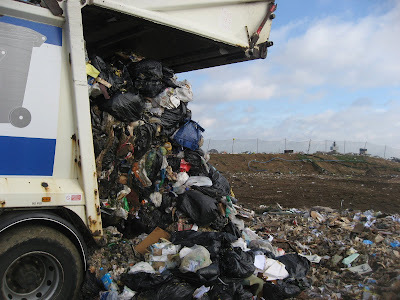 The services are operated by a company called Waste Recycling Group. So it's worth checking out their website, to see if they manage waste recovery at a centre near you. Who knows, you might have hard plastic recycling nearby too. Even if it's not available yet, it's always worth checking with your local recycling officer to see if such services are coming soon. 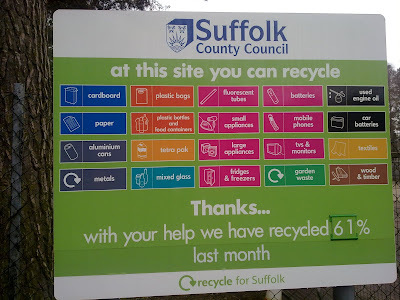 Alternatively, if you're passing through Suffolk, you could always drop them off at a participating recycling centre. Or would that be too cheeky? Well hello! How are you getting on with your mission to slim your bins? I hope the gradual steps over the the last few weeks have made it easier for you. Anyway welcome back to Week 4 of the Rubbish Diet challenge, where my alter-ego Delores, will be introducing all sorts of novel ways to tackle the crud that goes in your bin. Look at her! She's a force to be reckoned with and will be rooting through your bins if you're not careful, so if I were you, I'd have a good crack at taking in as many tips as you can from this week's challenge. Yes, this week's guide takes you through your domestic chores, encouraging you to reassess the amount of stuff that ends up in your rubbish, whether you're doing the washing up, the laundry or just running around the vacuum cleaner. Sorry I meant to write "running around WITH the vacuum cleaner", although I find the original statement far more entertaining. But there's even more you can do than that and the great news is with so many alternatives out there, it's not that difficult to reduce the amount of cleaning waste that ends up in your bin. And when you've finished, let me know how you get on and I promise I'll keep Delores at bay! UPDATE: Here's a bit of link-love. To see what NixdMinx makes of Ecover's latest range of waste-free products and how she's getting on without kitchen roll, pop over to her post about Green Living.